Dandelion PE is a really very nice and sleek texture pack for Minecraft PE. It is suitable for anyone who likes simple and organic colors and simplicity in the game. Because the simplicity gives an incredibly sunny image to this texture. The developers have also transformed the GUI. Now, it is exactly the same bright and cheerful like blocks. Dandelion PE - excellent texture pack that are completely change the "face" of all mobs in the game world! 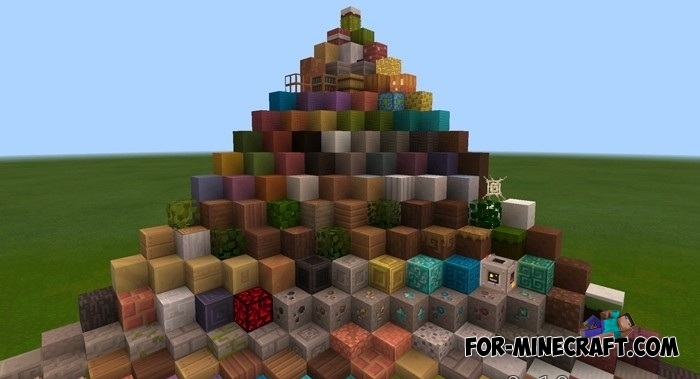 This graphical pack creates a smooth textures of many elements and blocks, so Minecraft Pocket Edition will remind you of some cartoon. For example, you will see the beautiful design of the moon (3d) and lighting. Everything will look absolutely differently, so you'll be pleasantly surprised by installing these textures! Dandelion Texture for MCPE 0.11.xCompletely redrawn mobs, lovely flowers, new blocks, objects and more awaits you in this texture-pack!